I had cash vouchers (pageant prize) from Dain Ti Hill, which I had to use before 31 December 2008. Since it was a shame to waste RM110, I took rif and Jeen there for lunch on Christmas Day. 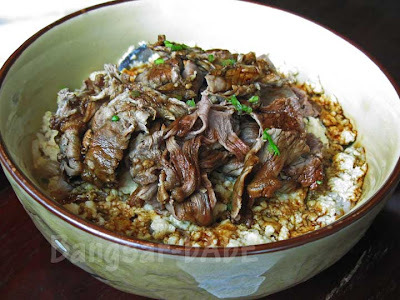 rif’s order of Beef Rice (RM18) was uninteresting and tasteless. 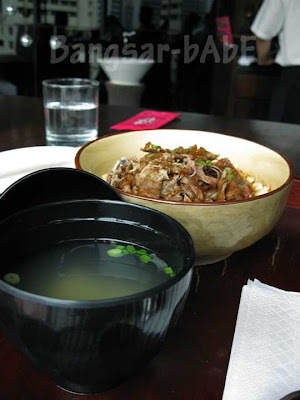 The beef slices were dully flavoured with black sauce, and served on top of white rice. Not something I would order. 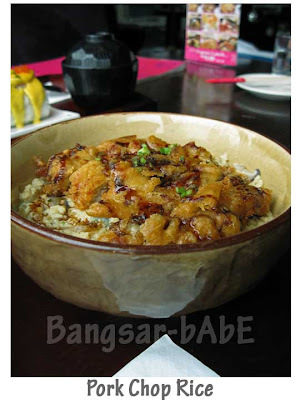 I had the pork chop rice, which was part of their lunch set (RM15++). The pork chop was tender with a crispy outside. Sadly, the bland rice did no justice to the otherwise decent pork chop. They should consider working on their gravies. 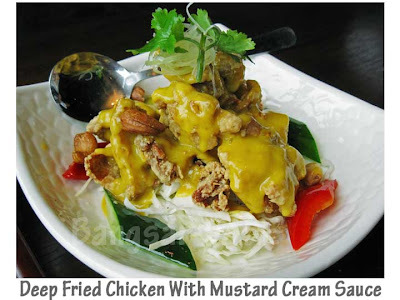 The Deep Fried Chicken With Mustard Cream Sauce (RM18) was tasty the last time we had it, so we ordered it again. 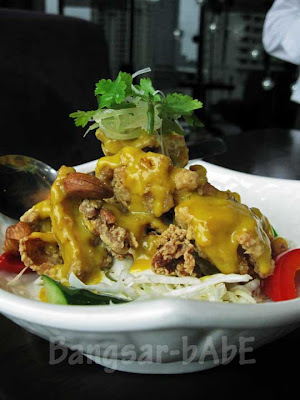 Crispy chicken paired with tangy mustard sauce, it was deliciously tender on the inside. My only gripe was the small portion, we would be happier diners with more. =) The Emperor’s Roll was also offered in the lunch set. 6 pieces instead of the usual 8, it was more than enough for the 3 of us. 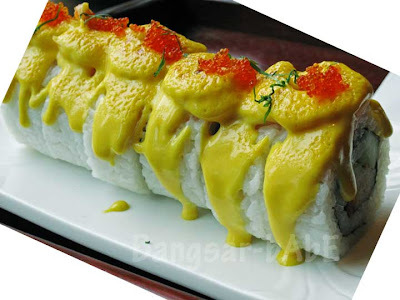 This sumptuous roll was delicate – an ingenious creation with sweet, savoury and tangy flavours all in one bite. 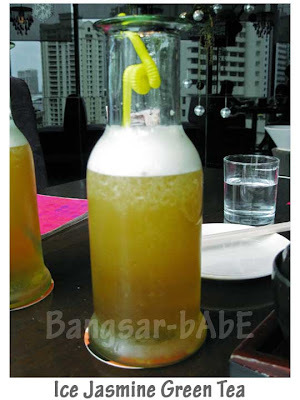 Jeen ordered the Calamansi Tea (RM12), which was merely fresh calamansi juice squeezed into fragrant tea. Since we ordered two lunch sets, we got two Ice Jasmine Green Teas. Refreshing, fragrant and not too sweet, I however prefer the honey original vinegar I ordered previously. 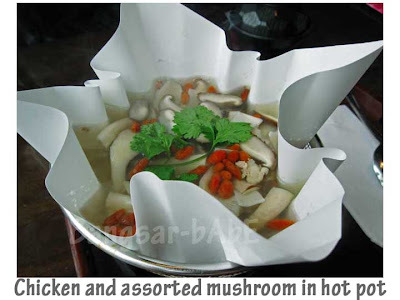 We ordered the chicken and assorted mushroom in hot pot because I’ve never had soup served in a paper pot (yes, I’m jakun). And also to use up the vouchers. The kei chi was probably just a form of garnishing as the soup was bland and boring. 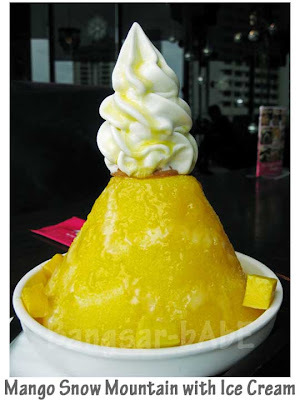 Since rif and Jeen both dislike red beans, we all settled for the Mango Snow Mountain with soft ice cream (RM15). The ice was fine and fluffy with a generous amount of mango puree inside and out. Even with the ice cream on top, it was average tasting and rather expensive. Service was SLIGHTLY better than the previous visit but still far from satisfactory. The waiters couldn’t really speak English, and I speak very broken Mandarin and Cantonese. Duck talking to chicken, go figure! 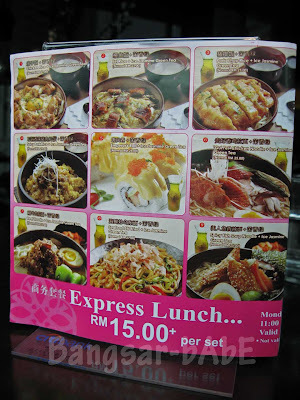 After using the cash vouchers (RM110 in total), lunch for 3 only cost me RM16.50. wah..still hav to pay somemore ontop of the vouchers? although i must admit the decor and the entrance looks enticing to try..
its just all these mix reviews tat says otherwise..
Yeap, total was RM126.50. I don’t like the decor la…so fluff! Food’s so so only. Not worth trying, if you asked me. Good for tea, esp Emperor’s Roll and the Iced Jasmine Green Tea. Re-invigorating.